district, the Quaker Valley School District, was established to serve the educational needs of students from eleven local boroughs. Ten years later, the new school district became the single taxing body which Mr. Clause had desired to provide local funding to the library. The school district provides close to 50% of the income revenue for SPL and three members from the QVSD school board serve on the library board. The relationship between the school district and the library goes beyond the financial tax structure as both entities share a mission to support lifelong learners. Numerous library programs provide continuing education opportunities to our adult community. 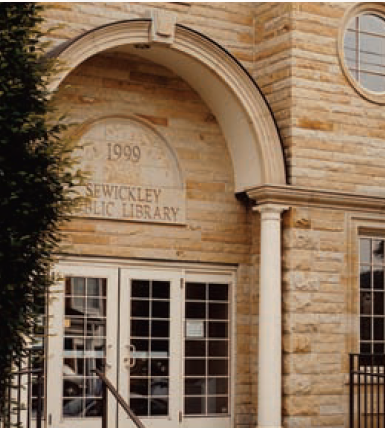 At the student level, collaboration between school librarians and their counterparts at Sewickley Public Library bring many programs to our community such as Battle of the Books, Summer Reading Programs, and hosting guest speakers. The Sewickley Public Library is one of only two in Pennsylvania that receives its local funding from the school district instead of local municipalities. We are certain that the school district and Sewickley Public Library will continue to work cooperatively on behalf of our lifelong learners throughout the Quaker Valley area.